On the cover, Hackman's back and growly. Turn the page and you've Dredd. He's angry. There's a revelation that'll possibly rock those who've been reading the Prog for a long while. And then at the end… oh my. I mean, we all knew there was something going on with Frank, but… I think I need a little sit down before I read the rest of this week's strips. Aye, Dredd this week was a real jaw dropper on that front. Flint's artwork continues to be a joy to behold as well. As for the rest of the prog, everything tootling along nicely. A good solid read as we edge ever closer to the end of year. I will miss Fiends, hope it comes back soon. The prog really is firing on all Cylinders right now. That Dredd episode! Not sure I can cope! Dave Taylor, should you be reading, the art on Fiends was absolutely fantastic. Great work. I'll miss it! It was a dramatic and shocking ending to the Dredd episode this week. But I also thought that the revelation about Blondel Dupre was a pretty big deal as well. Still full steam ahead with the prog, great stuff. The Prog is continuing to fire on all cylinders. Will need sometime to process the implications of the reveal in Dredd. Brink continues to be awesome. And has a change of palette. Fiends wraps up way quicker than expected, but there is the promise of more to come soon. In Kingdom Gene realise which side he should be on. Weakest thing, sad to say is Skip Tracer which slips back after a few promising weeks. And lets be honest a Prog this good deserves better than such trivial concerns. First and formost Dredd packs quite a punch... well should that be Dirty Frank does but that was fantastic. Skip Tracer continues to be the weakest thing in the Prog and yet still manages to be bloody great! Has a thrill ever turned around so much in the space one two stories? Brink continues to be sublime. Once again a simple conversation that packs so much development and tension seemingly effortlessly. Fiends ends superbly while setting up what's next and thankfully we won't have to wait long for it to return, though I think we have a different artist next time. Given what I figure will be a significent time slip that's all fair really. 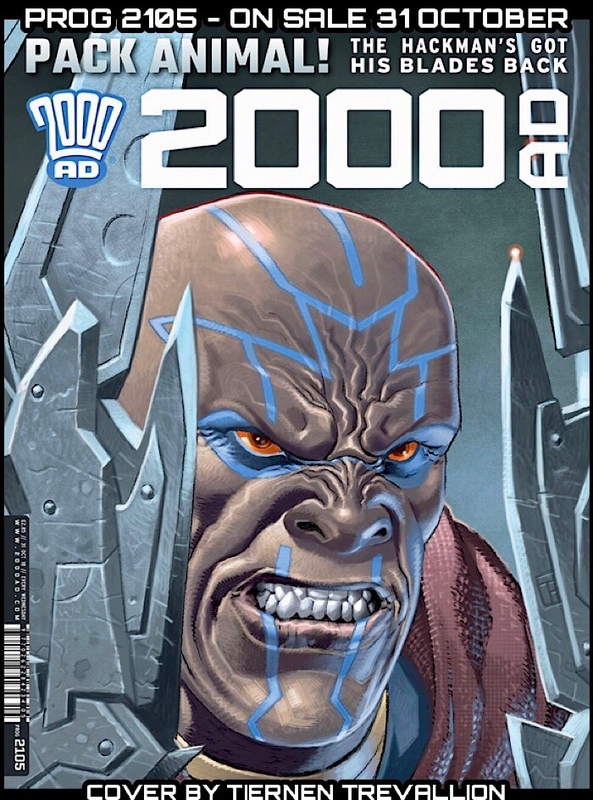 This has been brilliant and can't wait for Prog 2111. Finally Kingdom continues to be the definative 2000ad thrill. I almost feel sorry for the thrill that has to step up to the plate to fill the gap left by Fiends. But, while it might be be everyones cup of tea given that I think its more Dabnett with Steve Yeowell on Sinister Dexter I have no worries it will hold its own. MORE Abnett??? Not complaining, mind you. Arh sorry shows what I know. Could have sworn in 2100 at the end of Sinister Dexter in said returning in Prog... and thinking that back soon, wonder will make way. I was too lazy to check my facts last night! Quickly read the Dredd from a subscriber's copy at the Southern Contingent meeting on Saturday - quite the revelation or two - shall look forward to the re-read when i get my mitts on my own copy! Just got my prog in today. What can I say about Dredd? We were told nothing was going to be the same again and they have certainly delivered on that promise. To say I was not expecting this week's last panel would be an understatement. Skip Tracer continues to deliver a good story in a good artstyle. Brink: Is not good but this opinion is clearly in the minority. Each to their own. Fiends ends well but knowing what we know about Constanta's fate from the first series, I wonder what role Armand D'Hubert has for the future. Kingdom: Gene has had a long journey with many different scenarios that could have led to a happy life, but it always gets taken away from him. His original pack, his original mission, living with humans, living with wild aux, living within a community, it never seems to work out. He is always hunted and always must fight and move on. After all that and after all he has lost, is it any wonder he doesn't trust anyone and wants to make his own decisions for his own kind? We must be coming to another reckoning now. There is a definate sense of urgency coming through in this week's episode. A deadline has been declared, something big is coming. okay, all of you who were whinging about Dirty Frank please stand up and explain yourself to the rest of the Class? And Frank Oftheboard please write a thousand words on 'Synergy in the Prog' for next week?